A Guide to Choosing the Right Marquee For Your Event. A marquee is a perfect addition to any outdoor event, and the ideal outdoor event has a great marquee for everyone. One thing many people seem to not realise about a marquee is that it can’t always fit everyone at your event in it at once, and without correct planning and number confirmation, you might end up with a crowded soiree. To offset this problem, we have put together this succinct list of things to keep in mind when choosing a marquee for your outdoor event, in the hopes that it helps you find the right marquee for your wonderful party. The size of your marquee is the most important factor for whether or not it will be the right one for your event, because the right sized marquee can make a party really pop. Different sizes are good for different things, so a larger marquee will support a larger crowd. This would, therefore, be a better choice for events like weddings or annual company Christmas parties. On the other side of the spectrum, a smaller one is better for less busy events, so a work barbecue or a birthday party. Making sure to pick the right marquee for your party will not only mean you have the exact right amount of room but will also save you money. 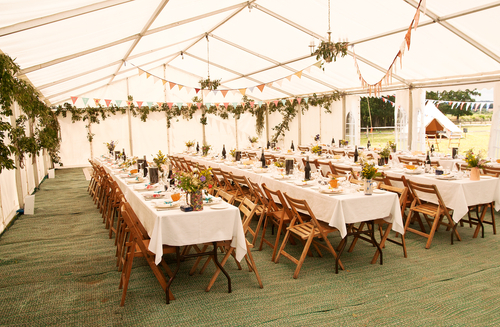 The next factor to consider in your search for the perfect marquee is the seating and tables factor. Depending on the event, you might need to hire a large number of tables and a correspondingly large number of chairs to suit the aforementioned tables. If your event is wedding-sized or larger, hiring tables and chairs with the marquee is your best bet, as the company will be able to tell you if that number of chairs and tables will fit under one canopy, and if not, how much more you’ll need. It’s important that you finalise number before reaching this step, otherwise, some of your guests may be left out. The flooring for your marquee is important, because unlike an indoor marquee setup there won’t be any pre-existing floor upon which to set everything up. Unless the natural floor of dirt and grass is what you’re aiming for, hiring a floor is highly recommended and easily added to any order. Different kinds of floors are applicable to different events, so let your company correspondent what you need and we can find it for you. Finally, music plays a big part in any event, and a band isn’t always a viable option for every party situation. Hiring speakers and bluetooth audio devices is a great fix for the problem of a potentially quiet event, and a bit of background noise is known to encourage conversation between new acquaintances, making it a must-have for work events and business meetings of any kind. These factors will help you to get the ideal marquee setup happening for your next event, and we offer all of these extras as well, making any running around town unnecessary. Don’t hesitate, call up today and get stuck into planning your next event with Marquee Monkeys!